So I thought I would provide a counterpoint that is less a rebuttle and more a triangulated perspective. To begin, I think the assertions of “death of” TV, advertising and brands are absolutely connected and evolutionary in nature. TV is a subset (and the biggest component) of advertising; and advertising has been the predominant input or contributing ingredient of the brand recipe. Classic marketing theory has been built upon the 4 P’s (Product, Price, Place, Promotion) and it is the P of Promotion that similarly has enjoyed the lion’s share of attention and investment in the Brand Mix. I wrote, “Life after the 30-second spot” some 13 years ago and in it, I asserted that the 4 P’s have become commoditized. All washing detergents work; all toothpaste cleans; all candy tastes good but is bad for you. Pricing is essentially transparent. Location is ubiquitous. And don’t get me started on the backlash against advertising. To be clear, I’m not sure I would necessary “harb” on the same 4 points (I was just reconciling them). WE created brands. WE kept them alive (and some on life support) by romancing and doubling down on the formulaic narrative. And now WE will need to figure out how to save them. The fact remains, if brands are to survive, they’re going to need to remain relevant and provide real value to their entire ecosystem and their stakeholders. They’re going to need to evolve. And by definition, evolve implies the openness and ability to adapt to change. And that change will absolutely pivot around distribution, promotion, loyalty and advocacy, R&D, innovation, customer service and more. Right now, I fear that many of these items are being ignored or neglected at worst, and paid lip service to at best. And if that continues, those same harbingers will be moving on from the death of brands to an even more ominous prediction, the death of corporations. Warp speed and Teleportation may not quite be ready for Prime Time (or the Prime Directive), but the Holodeck appears to be gearing up for launch. Last week, Evol8tion took one of our clients on a curated 2-day tour in Los Angeles of the Virtual Reality (VR) space. During this window, we visited various studio, tech companies and startups that are currently innovating from the front-lines and "imagineering" the future of VR. So does VR "change everything"? Will the VR industry ever get ahead of the perceived number 1 challenge of having to put on a headset (see: 3DTV)? How is this different to the failed attempts of the past (see: Second Life)? Are any of these questions actually relevant? So unless you've tested out the technology and applications yourself (and no, a quick demo at SxSW does not really count), you really need to park your opinion at the door of ignorance before opening your giant yap and passing any premature judgement. When you look at progress and in particular with innovation itself, it's important to recognize the "failed attempts of the past" all played a part in paving the way for their successors. Timing and luck are both important contributors and factors in combining to deliver an idea that sticks or tips. In other words, Pokeman Go has Minecraft to thank, which in turn has Second Life to thank for doing the thankless job of pioneering. As for the headsets, I don't think it's a stretch to imagine a time where they don't exist or if they do, they are no more intrusive (culturally, socially, behaviorally) than reading or sunglasses. I'm actually not sure this is even a "thing" to be concerned about as a barrier to entry. It might even be a necessary precursor to fool your brain into accepting you're somewhere else, which is a primary characteristic of the space. The transformative or perhaps a better word is transcendent experience that comes from stepping into a Futuristic kitchen (Job Simulator on HTC Vive), avoiding a Blue Whale under the sea, standing next to American Ninja Warrior's Vertical Wall or hanging out in a Tibetan hut is worth it. I also enjoyed whizzing around a track with a fan blowing air into my face to simulate the whoosh of being in a racing car. The list goes on. And that's the point. Each time you experience a different interpretation or application of a narrative, evolved and adapted to an immersive and pervasive presence, it opens a multitude of possibilities for new use cases. In some cases - such as travel & tourism - I would be as bold as to say that they should cut their entire advertising budget in favor of VR. I'm not exaggerating here. Hey, I did write "Life after the 30-second spot" and Z.E.R.O. Paid Media as the New Marketing Model after all. In other cases, such as Consumer Packaged Goods, it's a little more challenging. I said, challenging; NOT Impossible. I heard a great quote from the tour that sums up the world we came form versus the one we are heading towards: Create the Experience or Experience the Creative. It's not an either/or, but in fact an "AND" - so why wouldn't you proactively do both? Perhaps this is why Robert Scoble jumped ship from reality to virtual reality. Perhaps this is why LA is a VR hotbed of growth and investment? If you are wondering what all the fuss is about, perhaps you should take a tour (virtual or otherwise) to experience this phenomenon first hand and decide for yourselves if this is hype or hope? Perhaps you'll want to take a voyeuristic route and watch from the sidelines, which ironically is kind of the VR point, but not especially beneficial in terms of first mover or competitive advantage. Every journey begins with a step and now you can take that giant leap for marketingkind. No really, you can actually step on the moon! Or climb Everest! Whatever you do, I would caution against ignoring VR. You do so at your peril. I would recommend you frame your perspective against a blue ocean of possibilities versus searching for research or best practices. In a world of test 'n learns, it's time to focus on the learn part. Sure you might have bigger fish to fry, so don't bet the farm unnecessarily on VR (especially if you're in the toilet paper business). For everyone else, there is a pretty robust and fertile sandbox to dream...or even daydream. VR is not the next big thing. It's an evolution of the last big thing. And that is in of itself, not a small thing. In Flip the Funnel, I outlined Obama '08 as one of the best in class case studies exemplifying what it is to deploy a "retention as the new acquisition" inside-out approach to marketing. Little did I know, I would be turning to politics once again to demonstrate and validate my* 4th book, "Z.E.R.O." Donald J. Trump - hate him or love him - and I will keep my personal opinion separate to this piece (you just need to visit my Facebook page to see what I really think) has shown without much wiggle room or doubt the power of "Z.E.R.O. Paid Media as the New Marketing Model". Oh I know where you're about to head...you're going to blame the "message" vs the "medium" Stupid creative! Be more persuasive next time (to the tune of Homer Simpson)! Still fighting me? Of course you are...you're going to blame the "product" versus the advertising and possibly cite that ridiculous and pathetic excuse, "there's no better way to kill a bad product than with great advertising." Hang on, you're still protesting that the political bubble is unique and is not representative of the real world. You're right...it's much simpler than the cluttered, noising SKU-infested REAL world of toothpaste, detergent, cellular providers, cars and home mortgages where the tyranny of choice makes life damn near impossible for you. ...and now we return you to our regularly schedule program, the reality show that is Donald J Drumpf. The Donald might as well be called "The Dude" when it comes to playing the system; the media; and well, playing you as well with a simple spin on "Sticks and stones make break my bones, but words will never harm me." As a conspiracy theory aside, I've wondered whether he was always trying to pull of a Verbal on us by pulling off the greatest MEDIA con in the history of the business...using the MEDIA as the perfect conduit and weapon of mass distraction. I always felt there was going to be an A-HA reveal; a gotcha....but it never came. The Jimmy Kimmel skit with Producers' Nathan Lane and Matthew Broderick was not far off. Perhaps Trump was looking to further his brand, which he currently values at $3bn! ...and then, when the media, together with the gullible, desperate and/or dumb populous lapped up the rhetoric and did not immediately reject and regurgitate it in disgust, something weird happened: he either started to believe his own lies (a common side effect of narcissism) or unequivocably did not and instead doubled-, tripled- and quadrupled-down on nonsense in an attempt to shock the body to reject its host. Personally, I think - I KNOW - that should he be offered "The final rose", he will break our hearts by telling us he is not in love with us...but in fact with someone else (HIMSELF) and reject our proposal. So what does this have to do with Zero Paid Media as the New Marketing Model? Besides, everything??? Z.E.R.O. states that in a perfect world, the optimal paid media budget would be zero. Why would you need to pay for attention if you're paying attention? Why be a tenant (renting media) when you can be a landlord (owning and monetizing assets)? ...oh and Trump knows a thing or two about being a landlord for what it's worth. Z.E.R.O. is also an acronym for Zealots, Entrepreneurship, Retention and Owned Assets and Trump comes up "trumps" in the Zealots (can you say Trumpets? ), Entrepreneurship (the American dream is not to make it...not make it great...again) and Owned Assets categories. The earned media he's received is beyond compare. It's priceless. This is content strategy at its best. Or worst. Or best. Whilst I still don't think he is going to become President, it doesn't really matter at this stage. He has proven that "telling it like it is" is less about telling the truth and more about being a mirror or lens reflecting what - some - people are really thinking. And isn't that what a brand is at the end of the day? Nothing more than a mirror or reflection of a company's values, beliefs, and principles and a projection or connection to the people it hopes to serve, service or sell to? ...but in all seriousness, Donald J Trump has shown - beyond the shadow of a doubt - that power of Advocacy multiplied to the power of the ultimate asset, one's mouth. He's right you know: we wouldn't be talking about this stuff without him. You know, like racism. Real racism...not like #oscarssowhite. And I'm as guilty as the next. I still have 9 unplayed episodes of Homeland to watch...can't get to them as I'm watching the new reality show hit; the new must-see TV, CNN. I leave you with the words of CBS head honcho, Les Moonves: It may not be good for America, but it's damn good for CBS. We're all disciplies of the Church of Z.E.R.O. P.S.. Thank you Drumpf for curing my writer's block! Tags: "Donald Drumpf", "Donald J. Trump", "Donald Trump", "Earned Media", "Flip the Funnel", "John Oliver", "Joseph Jaffe", "Maarten Albarda", "Paid Media", "Zero Paid Media", CNN, Politics, Z.E.R.O. In this episode we discuss live and streaming (they are not the same thing), the rise of Periscope (and fall of Meerkat) and a few zings on pundits and punditry to boot. Give it a listen by downloading or listening here. Or you can subscribe to the show here. Apparently the "Bull" in Red Bull stands for false or misleading advertising as a court recently ruled in favor of customers who did not sprout wings. Who knew?! 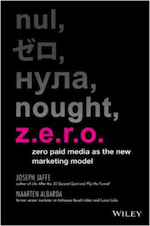 Here's my Jaffe Juice TV episode talking about this as well as my MediaPost article. PS Please subscribe to the channel if you like these videos. Mitch and I had a great conversation debate about creativity, the legitimacy and integrity of advertising, Jerry Seinfeld's zinger filled "acceptance speech" for winning an honarary Clio (you can read the full text here) and more. Personally I think the last 5-10 minutes are particularly powerful. Listen live or download here.